Pune will soon become World’s 1st city to have a city-wide WiFi connectivity, which won’t be free but based on a freemium model. Some of the biggest technology & infrastructure companies like Google, IBM, Larson & Toubro and RailTel have joined forces to implement the same. The feasibility of this WiFi project seems realistic because the scope is much bigger this time – It is not only WiFi but a comprehensive smart city project, which also includes several hi-tech features never before attempted in any Indian city. A sum of Rs 150 crore has been allocated for this smart city initiative. Pune city administration has formed a special purpose vehicle called Pune Smart City Development Corporation (PSCSCL), which oversee smart city features and capabilities which would be implemented across the city. Under their first contract, PSCSCL has chosen Google, L&T, IBM and RailTel to implement several smart city initiatives such as city-wide WiFi, environmental sensors, emergency call boxes across the city, public address system powered by digital mode, variable messaging displays, enhanced network connectivity, video analytics integration and more. And, Pune Administration is smart to understand that such massive exercises need revenues, which would be collected from the citizens. 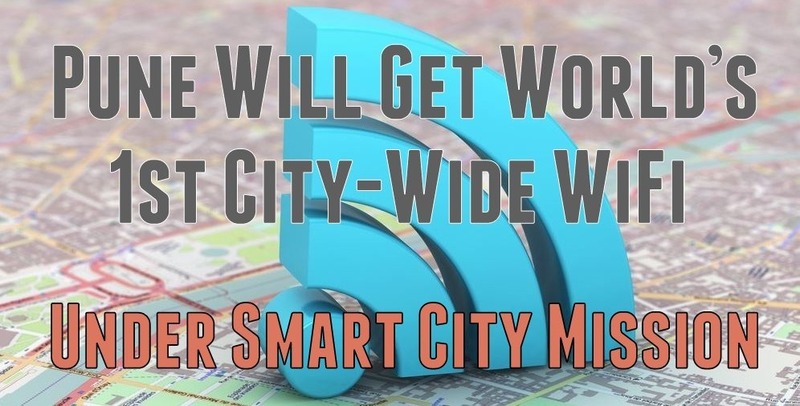 Kunal Kumar, Pune Municipal Commissioner said, “15-20% revenue generated through this citywide Wi-Fi network will be shared with the authority”. Pune city administration has done ample homework to understand the nuances of smart city implementation, and have accordingly allocated work to different specialised partners. For instance, under their first contract to implement city-wide WiFi along with other smart city initiatives, work has been smartly distributed among the chosen partners. Google has been asked to deploy their Google Station platform, which has an inbuilt WiFi network management capability and also uses monetization to make it sustainable. In association with Railtel, they have already exhibited their functioning in railway stations, and the same would be now done across Pune city. RailTel, another strategic partner, will provide last-mile connectivity using optical fiber, something which they did across 100+ railway stations in India. RailTel would be implementing 200 WiFi hotspots across strategic locations across Pune. Meanwhile, L&T has been roped in to become the ‘master system integrator’ for Pune Smart City Project and as per Srinivasan Ramamurthy, Lead -Smart World And Communication Business at L&T, they will help Google and RailTel to integrate every aspect together. And, IBM will be providing the hardware and software capabilities which will form the backbone of Pune Smart city Project. One of the major components undertaken by IBM is the implementation of Smart City Operation Centre (SCOC), which shall integrate 49 different smart city applications under one platform, and make the monitoring and observation task easier. The blueprint and the planning look impeccable this time. What we wait for is timely execution. We will keep you updated as we receive more information. "Pune Will Get World’s 1st City-Wide WiFi Under Smart City Mission; Google, IBM, L&T, RailTel Join Forces", 5 out of 5 based on 4 ratings. Amazon, Flipkart, Snapdeal Join Forces To Oppose GST! Chrome, Firefox Will Support Biometric Logins; Say Bye To Passwords! This is Awesome! :) Please do it to other cities as well :) ….but why are they using FOREIGN cos like IBM to do it? Can’t Indian cos do it on their own? ?